A single-nucleotide polymorphism, often abbreviated to SNP (/snɪp/; plural /snɪps/), is a substitution of a single nucleotide that occurs at a specific position in the genome, where each variation is present to some appreciable degree within a population (e.g. > 1%). For example, at a specific base position in the human genome, the C nucleotide may appear in most individuals, but in a minority of individuals, the position is occupied by an A. This means that there is a SNP at this specific position, and the two possible nucleotide variations – C or A – are said to be alleles for this position. SNPs underline differences in our susceptibility to a wide range of diseases (e.g. – sickle-cell anemia, β-thalassemia and cystic fibrosis result from SNPs). The severity of illness and the way the body responds to treatments are also manifestations of genetic variations. For example, a single-base mutation in the APOE (apolipoprotein E) gene is associated with a lower risk for Alzheimer's disease. A single-nucleotide variant (SNV) is a variation in a single nucleotide without any limitations of frequency and may arise in somatic cells. A somatic single-nucleotide variation (e.g., caused by cancer) may also be called a single-nucleotide alteration. 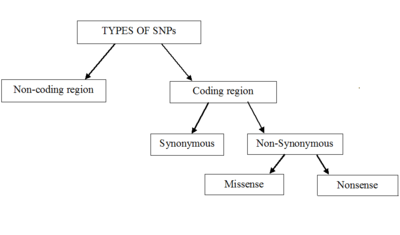 SNPs in the coding region are of two types: synonymous and nonsynonymous SNPs. Synonymous SNPs do not affect the protein sequence, while nonsynonymous SNPs change the amino acid sequence of protein. The nonsynonymous SNPs are of two types: missense and nonsense. SNPs that are not in protein-coding regions may still affect gene splicing, transcription factor binding, messenger RNA degradation, or the sequence of noncoding RNA. Gene expression affected by this type of SNP is referred to as an eSNP (expression SNP) and may be upstream or downstream from the gene. 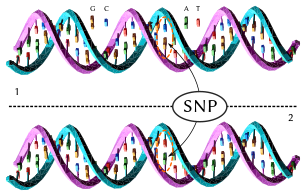 A tag SNP is a representative single-nucleotide polymorphism (SNP's) in a region of the genome with high linkage disequilibrium (the non-random association of alleles at two or more loci). Tag SNPs are useful in whole-genome SNP association studies, in which hundreds of thousands of SNPs across the entire genome are genotyped. Linkage disequilibrium (LD), a term used in population genetics, indicates non-random association of alleles at two or more loci, not necessarily on the same chromosome. It refers to the phenomenon that SNP allele or DNA sequence that are close together in the genome tend to be inherited together. LD is affected by two parameters: 1) The distance between the SNPs [the larger the distance, the lower the LD]. 2) Recombination rate [the lower the recombination rate, the higher the LD]. More than 84 million SNPs have been found across humans from multiple populations. A typical genome differs from the reference human genome at 4 to 5 million sites, most of which (more than 99.9%) consist of SNPs and short indels. The genomic distribution of SNPs is not homogenous; SNPs occur in non-coding regions more frequently than in coding regions or, in general, where natural selection is acting and "fixing" the allele (eliminating other variants) of the SNP that constitutes the most favorable genetic adaptation. Other factors, like genetic recombination and mutation rate, can also determine SNP density. Variations in the DNA sequences of humans can affect how humans develop diseases and respond to pathogens, chemicals, drugs, vaccines, and other agents. SNPs are also critical for personalized medicine. Examples include biomedical research, forensics, pharmacogenetics, and disease causation, as outlined below. SNPs were used initially for matching a forensic DNA sample to a suspect but it has been phased out with development of STR-based DNA fingerprinting techniques. In the future SNPs may be used in forensics for some phenotypic clues like eye color, hair color, ethnicity, etc. Kidd et al. have demonstrated that a panel of 19 SNPs can identify the ethnic group with good probability of match (Pm = 10^-7) in 40 population groups studied. One example of how this might potentially be useful is in the area of artistic reconstruction of possible premortem appearances of skeletonized remains of unknown individuals. Although a facial reconstruction can be fairly accurate based strictly upon anthropological features, other data that might allow a more accurate representation include eye color, skin color, hair color, etc. In a situation with a low amount of forensic sample or a degraded sample, SNP methods can be a good alternative to STR methods due to the abundance of potential markers, amenability to automation, and potential reduction of required fragment length to only 60-80 bp. In the absence of a STR match in DNA profile database; different SNPs can be used to get clues regarding ethnicity, phenotype, lineage, and even identity. A single SNP may cause a Mendelian disease, though for complex diseases, SNPs do not usually function individually, rather, they work in coordination with other SNPs to manifest a disease condition as has been seen in Osteoporosis. One of the earliest successes in this field was finding a single base mutation in the non-coding region of the APOC3 (apolipoprotein C3 gene) that associated with higher risks of hypertriglyceridemia and atherosclerosis. nonsense – point mutation in a sequence of DNA that results in a premature stop codon, or a nonsense codon in the transcribed mRNA, and in a truncated, incomplete, and usually nonfunctional protein product (e.g. Cystic fibrosis caused by the G542X mutation in the cystic fibrosis transmembrane conductance regulator gene). An intronic SNP in DNA mismatch repair gene PMS2 (rs1059060, Ser775Asn) is associated with increased sperm DNA damage and risk of male infertility. dbSNP is a SNP database from the National Center for Biotechnology Information (NCBI). As of June 8, 2015[update], dbSNP listed 149,735,377 SNPs in humans. The International HapMap Project, where researchers are identifying Tag SNPs to be able to determine the collection of haplotypes present in each subject. The International SNP Map working group mapped the sequence flanking each SNP by alignment to the genomic sequence of large-insert clones in Genebank. These alignments were converted to chromosomal coordinates that is shown in Table 1. This list has greatly increased since, with, for instance, the Kaviar database now listing 162 million single nucleotide variants (SNVs). SIFT This program provides insight into how a laboratory induced missense or nonsynonymous mutation will affect protein function based on physical properties of the amino acid and sequence homology. LIST (Local Identity and Shared Taxa) estimates the potential deleteriousness of mutations resulted from altering their protein functions. It is based on the assumption that variations observed in species closely related to human are more significant when assessing conservation compared to those in distantly related species. SNPVizThis program provides a 3D representation of the protein affected, highlighting the amino acid change so doctors can determine pathogenicity of the mutant protein. ^ "single-nucleotide polymorphism / SNP | Learn Science at Scitable". www.nature.com. Archived from the original on 2015-11-10. Retrieved 2015-11-13. ^ Ingram, V. M. (13 October 1956). "A specific chemical difference between the globins of normal human and sickle-cell anaemia haemoglobin". Nature. 178 (4537): 792–794. doi:10.1038/178792a0. PMID 13369537. ^ Chang, J. C.; Kan, Y. W. (June 1979). "Beta 0 thalassemia, a nonsense mutation in man". Proceedings of the National Academy of Sciences of the United States of America. 76 (6): 2886–2889. doi:10.1073/pnas.76.6.2886. PMC 383714. PMID 88735. ^ Hamosh, A.; King, T. M.; Rosenstein, B. J.; Corey, M.; Levison, H.; Durie, P.; Tsui, L. C.; McIntosh, I.; Keston, M.; Brock, D. J.; Macek, M.; Zemková, D.; Krásničanová, H.; Vávrová, V.; Macek, M.; Golder, N.; Schwarz, M. J.; Super, M.; Watson, E. K.; Williams, C.; Bush, A.; O'Mahoney, S. M.; Humphries, P.; Dearce, M. A.; Reis, A.; Bürger, J.; Stuhrmann, M.; Schmidtke, J.; Wulbrand, U.; Dörk, T. (August 1992). "Cystic fibrosis patients bearing both the common missense mutation Gly----Asp at codon 551 and the delta F508 mutation are clinically indistinguishable from delta F508 homozygotes, except for decreased risk of meconium ileus". American Journal of Human Genetics. 51 (2): 245–250. PMC 1682672. PMID 1379413. ^ Wolf, A. B.; Caselli, R. J.; Reiman, E. M.; Valla, J. (April 2013). "APOE and neuroenergetics: An emerging paradigm in Alzheimer's disease". Neurobiology of Aging. 34 (4): 1007–17. doi:10.1016/j.neurobiolaging.2012.10.011. PMC 3545040. PMID 23159550. ^ Zhang, Kui; Qin, Zhaohui S.; Liu, Jun S.; Chen, Ting; Waterman, Michael S.; Sun, Fengzhu (1 May 2004). "Haplotype Block Partitioning and Tag SNP Selection Using Genotype Data and Their Applications to Association Studies". Genome Research. 14 (5): 908–916. doi:10.1101/gr.1837404. PMC 479119. PMID 15078859. Archived from the original on 8 May 2018. Retrieved 8 May 2018 – via genome.cshlp.org. ^ Gupta, P.K. ; Roy, J.K.; Prasad, M. (25 February 2001). "Single nucleotide polymorphisms: a new paradigm for molecular marker technology and DNA polymorphism detection with emphasis on their use in plants". Current Science. 80 (4): 524–535. Archived from the original on 13 February 2017. ^ The 1000 Genomes Project Consortium (October 2015). "A global reference for human genetic variation". Nature. 526 (7571): 68–74. doi:10.1038/nature15393. PMC 4750478. PMID 26432245. ^ Barreiro L. B.; Laval G.; Quach H.; Patin E.; Quintana-Murci L. (March 2008). "Natural selection has driven population differentiation in modern humans". Nature Genetics. 40 (3): 340–345. doi:10.1038/ng.78. PMID 18246066. ^ Nachman, Michael W. (September 2001). "Single-nucleotide polymorphisms and recombination rate in humans". Trends in Genetics. 17 (9): 481–485. doi:10.1016/S0168-9525(01)02409-X. PMID 11525814. ^ M. A. Varela; W. Amos (March 2010). "Heterogeneous distribution of SNPs in the human genome: Microsatellites as predictors of nucleotide diversity and divergence". Genomics. 95 (3): 151–159. doi:10.1016/j.ygeno.2009.12.003. PMID 20026267. ^ Thomas, P. E.; Klinger, R.; Furlong, L. I.; Hofmann-Apitius, M.; Friedrich, C. M. (2011). "Challenges in the association of human single-nucleotide polymorphism mentions with unique database identifiers". BMC Bioinformatics. 12: S4. doi:10.1186/1471-2105-12-S4-S4. PMC 3194196. PMID 21992066. ^ Butler, John M. (2010). Fundamentals of forensic DNA typing. Burlington, MA: Elsevier/Academic Press. ISBN 9780080961767. ^ Kidd, KK; Pakstis, AJ; Speed, WC; Grigorenko, EL; Kajuna, SL; Karoma, NJ; Kungulilo, S; Kim, JJ; Lu, RB; Odunsi, A; Okonofua, F; Parnas, J; Schulz, LO; Zhukova, OV; Kidd, JR (1 December 2006). "Developing a SNP panel for forensic identification of individuals". Forensic Science International. 164 (1): 20–32. doi:10.1016/j.forsciint.2005.11.017. PMID 16360294. ^ Budowle, B; van Daal, A (April 2008). "Forensically relevant SNP classes". BioTechniques. 44 (5): 603–8, 610. doi:10.2144/000112806. PMID 18474034. ^ Goldstein, J. A. (2001). "Clinical relevance of genetic polymorphisms in the human CYP2C subfamily". British Journal of Clinical Pharmacology. 52 (4): 349–355. doi:10.1046/j.0306-5251.2001.01499.x. PMC 2014584. PMID 11678778. ^ Lee, C. R. (July–August 2004). "CYP2C9 genotype as a predictor of drug disposition in humans". Methods and Findings in Experimental and Clinical Pharmacology. 26 (6): 463–472. PMID 15349140. ^ Yanase, K.; Tsukahara, S.; Mitsuhashi, J.; Sugimoto, Y. (8 March 2006). "Functional SNPs of the breast cancer resistance protein ‐ therapeutic effects and inhibitor development". Cancer Letters. 234 (1): 73–80. doi:10.1016/j.canlet.2005.04.039. PMID 16303243. ^ Fareed, M.; Afzal, M. (April 2013). "Single-nucleotide polymorphism in genome-wide association of human population: A tool for broad spectrum service". Egyptian Journal of Medical Human Genetics. 14 (2): 123–134. doi:10.1016/j.ejmhg.2012.08.001. ^ Singh, Monica; Singh, Puneetpal; Juneja, Pawan Kumar; Singh, Surinder; Kaur, Taranpal (2010). "SNP–SNP interactions within APOE gene influence plasma lipids in postmenopausal osteoporosis". Rheumatology International. 31 (3): 421–3. doi:10.1007/s00296-010-1449-7. PMID 20340021. ^ Rees, A; Shoulders, CC; Galton, DJ; Baralle, FE (1983). "DNA polymorphism adjacent to human apoprotein A-1 gene: relation to hypertriglyceridaemia". Lancet. 321 (8322): 444–446. doi:10.1016/S0140-6736(83)91440-X. PMID 6131168. ^ Li, G.; Pan, T.One of the earliest successes in this field was finding a single base mutation in the non-coding region of the APOC3 (apolipoprotein C3 gene) that associated with higher risks of hypertriglyceridemia and atherosclerosis (see David J Galton Lancet 1983 pp444-446). ; Guo, D.; Li, L. C. (2014). "Regulatory Variants and Disease: The E-Cadherin -160C/A SNP as an Example". Mol Biol Int. 2014: 967565. doi:10.1155/2014/967565. PMC 4167656. PMID 25276428. ^ Lu, Yi-Fan; Mauger, David M.; Goldstein, David B.; Urban, Thomas J.; Weeks, Kevin M.; Bradrick, Shelton S. (4 November 2015). "IFNL3 mRNA structure is remodeled by a functional non-coding polymorphism associated with hepatitis C virus clearance". Scientific Reports. 5: 16037. doi:10.1038/srep16037. PMC 4631997. PMID 26531896. ^ Kimchi-Sarfaty, C.; Oh, JM. ; Kim, IW. ; Sauna, ZE. ; Calcagno, AM. ; Ambudkar, SV. ; Gottesman, MM. (Jan 2007). "A "silent" polymorphism in the MDR1 gene changes substrate specificity". Science. 315 (5811): 525–8. doi:10.1126/science.1135308. PMID 17185560. ^ Al-Haggar M; Madej-Pilarczyk A; Kozlowski L; Bujnicki JM; Yahia S; Abdel-Hadi D; Shams A; Ahmad N; Hamed S; Puzianowska-Kuznicka M (2012). "A novel homozygous p.Arg527Leu LMNA mutation in two unrelated Egyptian families causes overlapping mandibuloacral dysplasia and progeria syndrome". Eur J Hum Genet. 20 (11): 1134–40. doi:10.1038/ejhg.2012.77. PMC 3476705. PMID 22549407. Archived from the original on 2015-11-16. ^ Cordovado, SK. ; Hendrix, M.; Greene, CN. ; Mochal, S.; Earley, MC. ; Farrell, PM. ; Kharrazi, M.; Hannon, WH. ; Mueller, PW. (Feb 2012). "CFTR mutation analysis and haplotype associations in CF patients". Mol Genet Metab. 105 (2): 249–54. doi:10.1016/j.ymgme.2011.10.013. PMC 3551260. PMID 22137130. ^ Giegling I; Hartmann AM; Möller HJ; Rujescu D (November 2006). "Anger- and aggression-related traits are associated with polymorphisms in the 5-HT-2A gene". Journal of Affective Disorders. 96 (1–2): 75–81. doi:10.1016/j.jad.2006.05.016. PMID 16814396. ^ Kujovich, J. L. (Jan 2011). "Factor V Leiden thrombophilia". Genet Med. 13 (1): 1–16. doi:10.1097/GIM.0b013e3181faa0f2. PMID 21116184. ^ Morita, Akihiko; Nakayama, Tomohiro; Doba, Nobutaka; Hinohara, Shigeaki; Mizutani, Tomohiko; Soma, Masayoshi (2007). "Genotyping of triallelic SNPs using TaqMan PCR". Molecular and Cellular Probes. 21 (3): 171–6. doi:10.1016/j.mcp.2006.10.005. PMID 17161935. ^ Prodi, D.A. ; Drayna, D; Forabosco, P; Palmas, MA; Maestrale, GB; Piras, D; Pirastu, M; Angius, A (2004). "Bitter Taste Study in a Sardinian Genetic Isolate Supports the Association of Phenylthiocarbamide Sensitivity to the TAS2R38 Bitter Receptor Gene". Chemical Senses. 29 (8): 697–702. doi:10.1093/chemse/bjh074. PMID 15466815. ^ Ammitzbøll, Christian Gytz; Kjær, Troels Rønn; Steffensen, Rudi; Stengaard-Pedersen, Kristian; Nielsen, Hans Jørgen; Thiel, Steffen; Bøgsted, Martin; Jensenius, Jens Christian (28 November 2012). "Non-Synonymous Polymorphisms in the FCN1 Gene Determine Ligand-Binding Ability and Serum Levels of M-Ficolin". PLoS ONE. 7 (11): e50585. doi:10.1371/journal.pone.0050585. PMC 3509001. PMID 23209787. Archived from the original on 7 June 2015. ^ Ji G, Long Y, Zhou Y, Huang C, Gu A, Wang X (2012). "Common variants in mismatch repair genes associated with increased risk of sperm DNA damage and male infertility". BMC Med. 10: 49. doi:10.1186/1741-7015-10-49. PMC 3378460. PMID 22594646. ^ Glusman, G; Caballero, J; Mauldin, D. E.; Hood, L; Roach, J. C. (2011). "Kaviar: An accessible system for testing SNV novelty". Bioinformatics. 27 (22): 3216–7. doi:10.1093/bioinformatics/btr540. PMC 3208392. PMID 21965822. ^ Cao, R; Shi, Y; Chen, S; Ma, Y; Chen, J; Yang, J; Chen, G; Shi, T (29 November 2016). "dbSAP: single amino-acid polymorphism database for protein variation detection". Nucleic Acids Research. 45 (D1): D827–D832. doi:10.1093/nar/gkw1096. PMC 5210569. PMID 27903894. ^ Sachidanandam, R.; Weissman, D.; Schmidt, S. C.; Kakol, J. M.; Stein, L. D.; Marth, G.; Sherry, S.; Mullikin, J. C.; Mortimore, B. J.; Willey, D. L.; Hunt, S. E.; Cole, C. G.; Coggill, P. C.; Rice, C. M.; Ning, Z.; Rogers, J.; Bentley, D. R.; Kwok, P. Y.; Mardis, E. R.; Yeh, R. T.; Schultz, B.; Cook, L.; Davenport, R.; Dante, M.; Fulton, L.; Hillier, L.; Waterston, R. H.; McPherson, J. D.; Gilman, B.; Schaffner, S. (2001). "A map of human genome sequence variation containing 1.42 million single-nucleotide polymorphisms". Nature. 409 (6822): 928–933. doi:10.1038/35057149. PMID 11237013. ^ J.T. Den Dunnen (2008-02-20). "Recommendations for the description of sequence variants". Human Genome Variation Society. Archived from the original on 2008-09-14. Retrieved 2008-09-05. ^ den Dunnen, Johan T.; Antonarakis, Stylianos E. (2000). "Mutation nomenclature extensions and suggestions to describe complex mutations: A discussion". Human Mutation. 15 (1): 7–12. doi:10.1002/(SICI)1098-1004(200001)15:1<7::AID-HUMU4>3.0.CO;2-N. PMID 10612815. ^ Ogino, Shuji; Gulley, Margaret L.; Den Dunnen, Johan T.; Wilson, Robert B.; Association for Molecular Pathology Training and Education Committee (2007). "Standard Mutation Nomenclature in Molecular Diagnostics Practical and Educational Challenges". The Journal of Molecular Diagnostics. 9 (1): 1–6. doi:10.2353/jmoldx.2007.060081. PMC 1867422. PMID 17251329. ^ Sachidanandam, Ravi; Weissman, David; Schmidt, Steven C.; Kakol, Jerzy M.; Stein, Lincoln D.; Marth, Gabor; Sherry, Steve; Mullikin, James C.; et al. (2001). "A map of human genome sequence variation containing 1.42 million single-nucleotide polymorphisms". Nature. 409 (6822): 928–33. doi:10.1038/35057149. PMID 11237013. ^ Altshuler, D; Pollara, V J; Cowles, C R; Van Etten, W J; Baldwin, J; Linton, L; Lander, E S (2000). "An SNP map of the human genome generated by reduced representation shotgun sequencing". Nature. 407 (6803): 513–6. doi:10.1038/35035083. PMID 11029002. ^ Drabovich, A.P. ; Krylov, S.N. (2006). "Identification of base pairs in single-nucleotide polymorphisms by MutS protein-mediated capillary electrophoresis". Analytical Chemistry. 78 (6): 2035–8. doi:10.1021/ac0520386. PMID 16536443. ^ Griffin, T J; Smith, L M (2000). "Genetic identification by mass spectrometric analysis of single-nucleotide polymorphisms: ternary encoding of genotypes". Analytical Chemistry. 72 (14): 3298–302. doi:10.1021/ac991390e. PMID 10939403. ^ Tahira, T.; Kukita, Y.; Higasa, K.; Okazaki, Y.; Yoshinaga, A.; Hayashi, K. (2009). "Estimation of SNP allele frequencies by SSCP analysis of pooled DNA". Methods Mol Biol. Methods in Molecular Biology. 578: 193–207. doi:10.1007/978-1-60327-411-1_12. ISBN 978-1-60327-410-4. PMID 19768595. ^ Nawar Malhis; Steven J. M. Jones; Jörg Gsponer (2019). "Improved measures for evolutionary conservation that exploit taxonomy distances". Nature Communications. 10. doi:10.1038/s41467-019-09583-2. ^ "View of SNPViz - Visualization of SNPs in proteins". genomicscomputbiol.org. Retrieved 2018-10-20. Wikimedia Commons has media related to Single nucleotide polymorphism. NCBI dbSNP database – "a central repository for both single base nucleotide substitutions and short deletion and insertion polymorphisms"
PharmGKB – The Pharmacogenetics and Pharmacogenomics Knowledge Base, a resource for SNPs associated with drug response and disease outcomes. GEN-SNiP – Online tool that identifies polymorphisms in test DNA sequences.